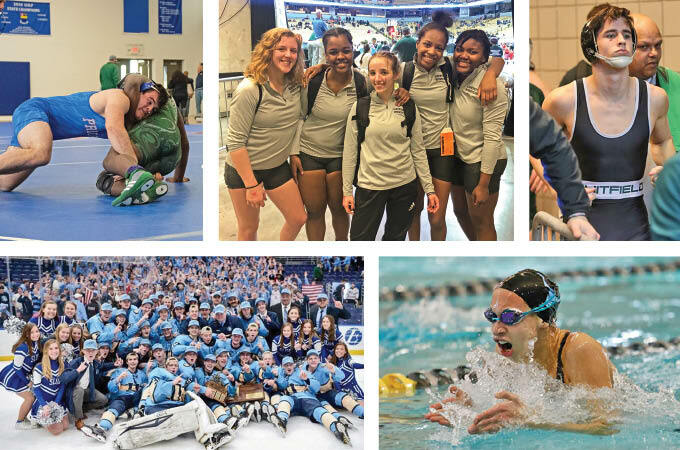 The winter sports season of 2018-19 featured a first-year sport (girls wrestling!) and plenty of success for area athletes and schools. It was a stellar season in the pool for area swimmers and divers. The state went to a two-class division last year, and the top four teams in each class win a trophy. Area teams captured six of the eight trophies this year, including a sweep in Class 1 and a sweep of the team champions. Ladue won the team title in Class 1 with 216 points. MICDS (191), Webster Groves (188) and Parkway West (155) also added a trophy to their collections. Paige Mitchell led the way for Ladue, winning the 200-yard and 500-yard freestyle. Mitchell also swam a leg of both the 200-yard and 400-yard free relays, which finished second to MICDS in each event. Freshmen Abby Wickersham, Sophie Henriksen and Anna Scott Baur teamed with senior Alex Fox to win the 200-yard free relay for MICDS. The same four came back to win the event-closing 400-yard free relay. Wickersham also finished second in the 100-yard free and third in the 50-yard free, while Henriksen was second in the 100-yard butterfly and the 100-yard backstroke. 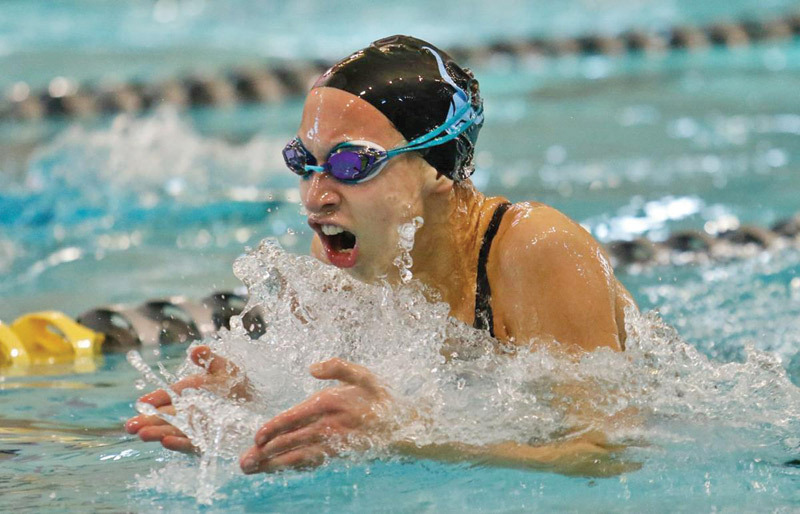 Parkway West’s Lauren Beard earned a state championship, winning the 200-yard IM. Westminster Christian Academy’s Margo O’Meara defended her diving championship in convincing fashion. Marquette gave the area a sweep of state titles, winning the Class 2 championship. The Mustangs finished with 278 points, well ahead of Rock Bridge with 224.5 points. Nerinx Hall was third as a team in Class 2. Marquette won with balance as it did not have an individual or relay champion. Carsyn Cosman and Amanda Yu each had second-place individual finishes. Cosman did so in the 200-yard freestyle, and Yu was second in the 100-yard butterfly. Kirkwood’s Ella Pearl was an individual champion in Class 2, winning the 100-yard backstroke. Nerinx Hall’s Meghan Bryan, Katie Knapp, Grace Schaefer and Emily Traube were champions in the 200-yard free relay. There were no area state champions in this sport. CBC took an eight-point lead into the fourth quarter in the Class 5 title game against Rock Bridge at Missouri State University in Springfield, but was outscored 26-14 in the fourth quarter and lost the game 63-59. Caleb Love had a tremendous final four for the Cadets, scoring a combined 53 points and finishing the season with a scoring average of 19.4. The Cadets had beaten Eureka 62-30 in the sectional round and Mehlville 69-56 in the quarterfinals to reach the final four. CBC had a comeback of its own in the semifinals against Francis Howell. The Cadets trailed 36-27 at halftime but rallied for a thrilling 64-62 victory. They finished the season with a 24-8 record. Ladue was the other area team that reached the final four. It had one of the most dramatic wins of the season in the sectional round of Class 4, tying the game in the final seconds and winning in overtime 48-45 over Jennings. Ladue defeated St. Charles West 54-40 in the quarterfinals to earn its trip to Springfield. The Rams lost to St. Mary’s 57-46 in the semifinals but ended their season with a 52-47 win over Logan-Rogersville in the third-place game. Ladue finished its season with a 21-9 mark. The area also featured the top scorer in the entire St. Louis area as Brentwood’s Chris Hill finished with a 27 point per game average. Parkway Central each had memorable seasons for girls, although neither finished with a state championship. Parkway Central was the only area team to reach the final four. The Colts did so in Class 5. They won 11 of their last 12 games to finish at 24-7. Parkway Central won its district and followed with a come-from-behind 58-55 win over Marquette in sectionals and a 51-37 triumph over Jackson in the quarterfinals. Jefferson City ended the Colts’ title hopes with a 43-29 win in the semifinals. Parkway Central finished the season on a high note with a 55-53 win over Republic in the third-place game. Parkway North reached the quarterfinals in Class 4. Marquette and Nerinx Hall won district titles in Class 5. The Vikings defeated Clayton 61-37 in sectionals but fell to eventual state champion Incarnate Word 60-52 in the quarterfinals. Parkway North, which finished at 23-7, handed Incarnate Word one of its two losses during the regular season. It was the only loss suffered by Incarnate Word to a Missouri team. 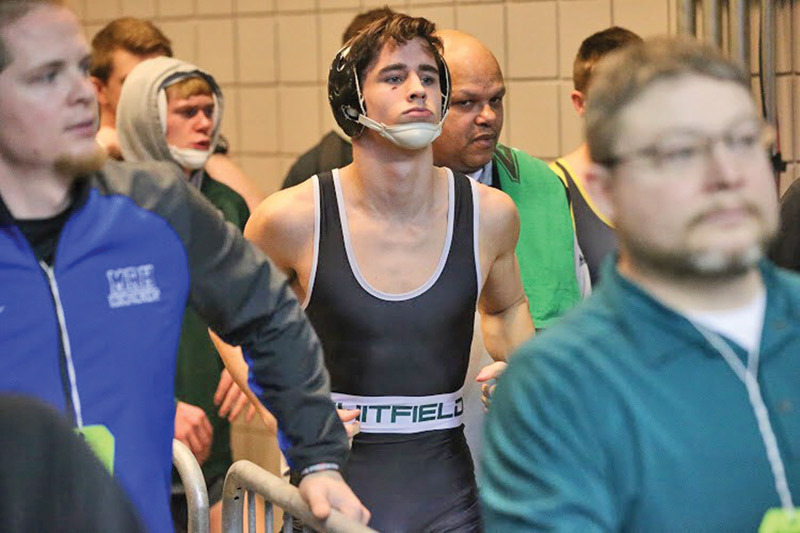 Whitfield also reached the quarterfinals in Class 3. The Warriors, who started the season 9-9, peaked at the right time, winning nine of their last 11 games. The team won districts and had an exciting overtime win over Cardinal Ritter in the sectional round. Its season concluded with a 52-41 loss to Lutheran North in the quarterfinals. Lutheran North eventually reached the championship game before falling to powerhouse Strafford, which won its fourth straight state title. The most exciting game of the entire winter season may have been the championship game of the Mid-States Club Hockey Association Challenge Cup. Martin Lyons deflected in a shot from Jack Hazelton in the second sudden-death overtime to give St. Louis University High a 3-2 victory over De Smet. It was the second straight title for the Junior Bills (who beat De Smet last year for the win as well) and their third overall, having also won in 2013. Defense was the key for the Junior Bills, who finished the season with a 23-3-2 record. SLUH only allowed 32 goals in its 27 games. Goaltenders Brendan Rasch and Dylan Bak combined for nine shutouts. The team had a 12-game winning streak during the season, allowing just four goals in its last six games. Lafayette won the Wickenheiser Cup, defeating Duchesne 4-2 in the championship game. It was the second title for the Lancers, who also won in 2006. Lafayette started slowly but won its final 10 games to finish with a 19-7-2 record. 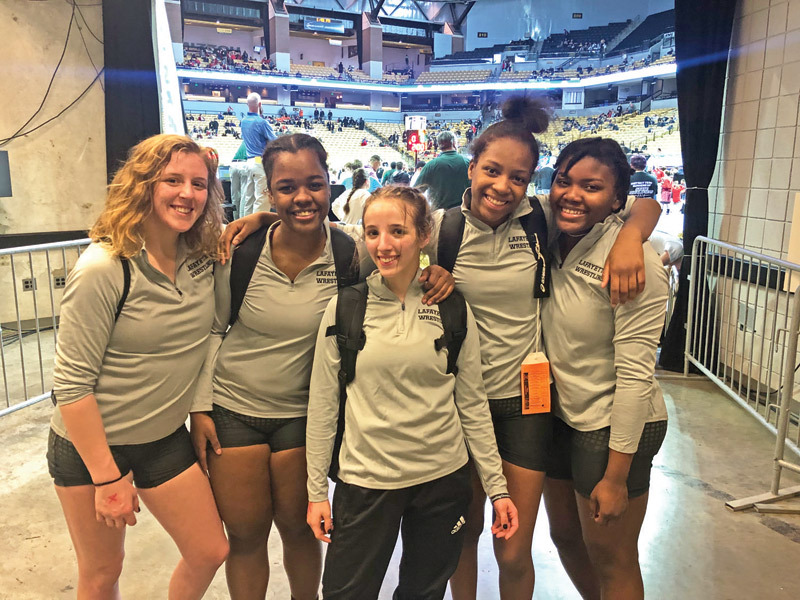 This season, Missouri became the ninth state to have separate boys and girls wrestling competitions. 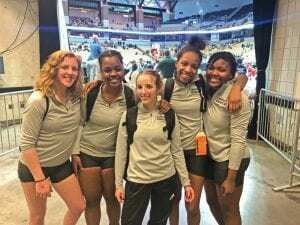 And a pair of sisters from Lafayette helped make history at the state meet held at the University of Missouri. Freshman Faith Cole and her sister Emma, a junior, were among the first-ever state champions. Technically, Faith became the first-ever girls wrestling state champion in Missouri as she won in the lowest weight class at 103 pounds. That championship concluded an undefeated season for the freshman, who also was named Wrestler of the Year in the Suburban Yellow Division. Emma won the state title at 143 pounds, and sophomore Josette Partney was second at 167 pounds. Those performances helped the Lancers to a second-place finish with 81 points in the team competition at state. Lebanon won first with 87 points. Lancer senior Treasure Smith also was named to the first team in her division. Hannah Jansen of Webster Groves received first-team honors in the Suburban Red Division, and Parkway West had two first-team picks in the Green Division, Paige Wehrmeister and Emma Carter. Two other area girls were named Wrestler of the Year in their conferences: Kirkwood’s Emma Schreiber for Red and Clayton’s Khaylie Ross for Green. Two local teams came home with titles in boys wrestling. Whitfield continued its dominance in Class 1, easily capturing the team championship. The Warriors finished with 192 points, well ahead of the 126.5 points by second-place Seneca. Whitfield had seven wrestlers competing in the championship match. Evan Binder, who finished with a 38-7 record, won at 103 pounds, and Logan Ferrero (38-6) was the individual champion at 120 pounds. The other five Warriors in championship matches finished second: Jason Shaw (113); Wade Raeman (138); Matthew Schueddig (152); Chase Brock (160); and Keith Miley (220). CBC was the other area team champion, winning in Class 4. The Cadets finished with 169.5 points, 10 more than second-place Liberty. Area schools De Smet and Lafayette finished fifth and sixth, respectively. CBC had four individual champions, all in consecutive weight classes: Vincent Zerban (43-3) at 132 pounds; Wyatt Henson (33-6) at 138 pounds; Kyle Prewitt (38-3) at 145 pounds; and Joshua Saunders (40-2) at 152 pounds. De Smet’s Cory Peterson capped off an undefeated season with a championship at 160 pounds. Peterson won his 39th match of the season in the championship match at state, 4-3, against Andrew Gamble of Belton, who entered the match with a 43-0 mark. Parkway South’s Garret Kloeppel lost to Henson in the championship match at 138 pounds and finished his season with a 42-2 mark. No area team finished in the top 10 in either Class 2 or Class 3, but there was one individual state champion in each class. 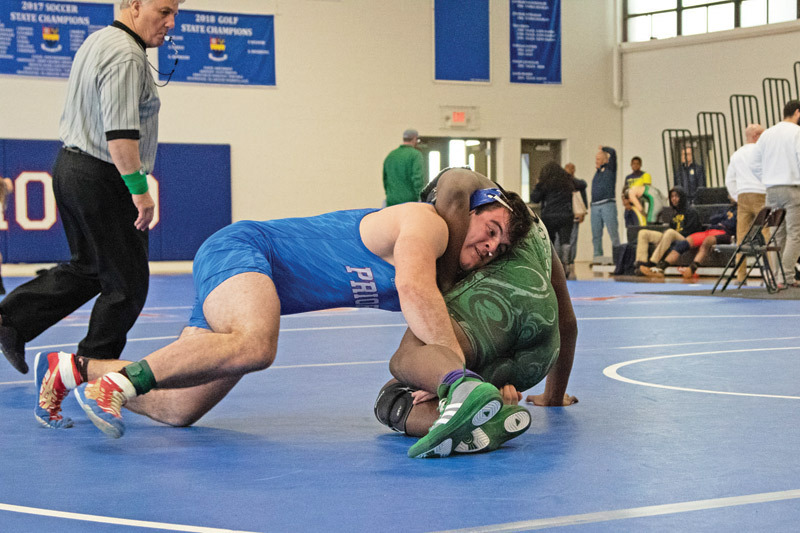 Priory’s Dalton Bingman (27-3) won at 220 pounds in Class 2, while Jacob Mann of Ladue won at 120 pounds in Class 3. Mann lost just one of his 31 matches this season.